"The drum is the Great Spirit's favorite instrument. That's why we were all given a heartbeat..."
Rawhide strip for the lacing. It is recommended to make a drum with a diameter of less than 12''. The depth of the frame is a variable; for a drum of 14''diameter or so, a depth of 3'' should be sufficient. For larger drums the frame needs to be deeper. This is partially for the look of the finished drum, but also to give the hoop more strength: the stretched dry skin will put quite a strain on the hoop, and may bend it, or at worse implode it. Because of this it is recommended the that hoop is made of wood of at least 1/8'' thick. ~The skin needs to be soaked until it is soft. Use the bath for this, filled with cold water. The time for this will vary depending on the type of skin used. Make sure the skin is totally submerged. ~Once the skin is soft, it can be worked with. Place it on a flat clean surface (use the plastic ground cloth to protect the floor) and select the part of the skin you will use for the drum head. Place the frame on this area to make sure it is big enough and totally free of holes or very thin parts. Remember, this is drum that you will keep for a lifetime and possibly pass on to next generations. The time you spend on the inspection of the skins, will be worth it. Once you are satisfied, use the pencil to draw a pattern round the frame. If you are doing a double sided Drum, repeat the same for the second skin. ~It is always better to draw on the back of the skin, the part that was inside the animal, as the outer part (the grain side), will be the part that you put on the outside of the drum. The way to tell the two sides apart is that the grain side has a surface that is looks like leather (generally smooth to the touch), and the inner side, has small cuts and scraped areas where the skin was fleshed after it was removed from the animal and has a rough touch. ~Remember that the circle you cut needs to be a lot bigger than the head of your drum, as it will have to go up the sides of the frame and a little way on to the back of the drum. As a rule of thumb, for an 12'' diameter drum on a 6'' deep hoop, you will need a circle of about 16''. Once the correct sized circle is drawn, it can be cut using sharp scissors. Put the complete circle back into the water to keep it soft and wet until you use it (unless its a double side Drum, then the edge of the skin should cover a third of the wall of the Drum). ~With the remainder of the skin, you can now cut the lacing you will use to lace the drum skin onto the frame. This needs to be long enough to do the whole lacing job, wet rawhide is not easy to join, knots slip very easily. The length of lace needed, varies according to the size of drum made, for an average drum, 20 times the diameter of the frame is a good length. This can be cut by spiraling around a roundish shaped off-cut of skin. Cut it approximately 1/4'' wide. It is always better to have the laces too thick rather than too thin, as later when you are tightening up the drum, you will be pulling quite hard on them, and the lace will stretch and get thinner and you do not want it to break. Once you have your lace cut, put it and all the spare skin you have back into the water. ~The next job is to cut the holes in your drum head that the lace will pass through. Using your pencil, mark the spot where you will punch the holes. With an adult watching, use the AWL to punch the holes. Be sure the holes are evenly spaced, so the tension will be even across the Drum head. Be sure you use an odd number for the total hole punched (7,9,11 etc.). The cut should be at least 1'' from the edge. Just remember, once you get started with the lacing, you cant stop. If you find you don't have time, you can leave them in the water to soak (but no longer than over night) or let them dry in an open air place and when you go back to work on the Drum, re-soak them. ~Once the slack has been all worked through, begin the whole process again, and then again, and again, until it feels like you cannot get any more slack out of the lace. Do not be afraid to pull quite hard on the lace, but do be careful not to break it, or the holes in the drum head; especially be careful if you are pulling on a particularly thin piece of lace. ~Once you feel satisfied that you cannot get any more slack out of the lace, you can begin to bind the back into a cross shaped hand hold. Not only will this make the drum easier to hold, but the act of making the cross squeezes the crisscrossing spokes of lace together and puts even more tension into the drum. 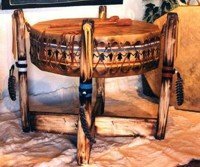 ~If you have made a drum with 17 lacing holes in the head, you will have 17 spokes. This cannot be divided by 4 evenly, so we suggest you divide it into 3 lots of 4 spokes and 1 of 5. Select a group of four adjacent spokes, and either using the spare end of your lace, or a specially cut piece, bind them together. Begin in the center of the drum, and bind outwards approximately 75-100mm. This binding can be finished off by using the spokes as the warp threads and the binding lace as the weft, and weaving a little section at the top of the binding. Tuck end back through weaving and trim underneath. When you have done one arm of the cross in this manner, do the opposite arm, and then the two other arms. ~at this point, you are done! Place the Drum in a warm, airy place. Avoid hot places, it will cause the leather to dry too quick. If your Drum does not dry out evenly, the frame may warp as it dries, and you will end up with a twisted drum. If you put enough tension into the wet rawhide, when it dries out, you will have a wonderful resonant drum; if you didn't, your drum may sound more like a cardboard box. If your brave enough and want to, you can take apart your drum and start over. The skin and hoop will be OK, but you will have to cut more lace. ~ If you like, you can paint your drum. The picture at the top of the article will give you a couple ideas. You can take a piece of soft leather or fur and wrap your handle with it to soften the handle. I'm so pleased with the overwhelming response to the Lady Hawke web page and newsletters (over 1200 subscribers now). I love the fact that so many souls can find information and hopefully a bit of peace here. Unfortunately the traffic has used up most of the bandwidth (number of allowed page views per day) allowed on this free server which means that the page will shut down about half way through the month until the following month. In the near future I will be buying web space to place the Lady Hawke Site upon. If anyone is in a position to donate even a dollar to this cause I would appreciate it. The donations will be used exclusively for the Lady Hawke Site web space.